Been AWHILE! So here is a Blog Sale!!! Some Brian Lumley covers for sale!!!! Here's some pix of New Mexico, at Bubonicon and, Albuquerque's Natural History Museum. Top is me with a Mastodon(Gompotherium species) skeleton, next is a panel at the con on working for the movies-I'm chatting with former Star Trek: The Next Generation story editor and writer, Melinda Snodgrass whom I got to know more after many years of being in the same room at the same time! Next is a drawing demo I did-a dragon in an hour(it sold at the con) and below that, a terrific diorama of an Allosaur skeleton attacking a Stegosaur skeleton. The museum is one of the very best and they have a full scale skeleton of a Seisemosaur(the largest Sauropod dinosaur!!!) on display. I last saw this very skeleton in Japan in 2002. Below is a sculpture of a Pentaceratops outside the museum!! What an amazing place to spend hours in. I'm a big fan of Natural History museums(Creationists-get a clue, evolution is a fact!) and this one really is in my top ten now! Home. After 3 weeks of travel, 5 airports, 3 hotels, 2 rental cars, numerous dinners and lunches out...we're back. I can't believe we did so much!! AND survived! Bubonicon was a blast-a small but very cool little con in Albuquerque NM. You could feel the energy buzzing there!!! Hung out with writers Jane Lindskold, George R.R. Martin, Melinda Snodgrass(who I got the know after a long time of passing in corridors at SF cons!) Dan Abraham, Ben Bova(and his charming wife) and many more. Also caught up with artist David Martin who I have only known about 25 years. I'm really exhausted. Had only four days to ourselves out of the 20 spent working-the other end of the business is talking, teaching and shmoozing in general. I saw so many Big Name SF writers my head was spinning after 3 weeks. Even the Writers/Illustrators of The Future week/event was just energized and full of great faces to see. Spent some time with Charles Brown of Locus Magazine. Caught up with Aleta Jackson-a pal who of many years who is now designing spaceships that REALLY work in the Mohave Desert. More soon. I need to re-acclimate with my home surroundings!!! Okay, I liked The Partridge Family back in the day and ALWAYS wanted an excuse to say that. I did, boarding the plane to Albuquerque, New Mexico where I am writing this from! The woman taking the tickets, by the way, acted sooooo like she'd never heard THAT one before! This place looks amazing. It's the third leg of the trip, last week worked out great with the workshop and ceremony for the Illustrators of The Future contest in Los Angeles. It's good to be moving again. I'm here for Bubonicon and will be seeing some cool scenery this week and doing the con toward the week's end. Okay, sorry, you now have(I'm guessing) that SONG title buzzing around in your head. The Denver World SF Con was a blast. A smaller crowd but it was really easy going and I wasn't exhausted as I normally am. Considering also the "thin" air there. I sold a bunch of paintings(I made the highest sales for the con artshow) and I met a whole bunch of cool people, several of whom are buyers of my work, and these blog paintings. 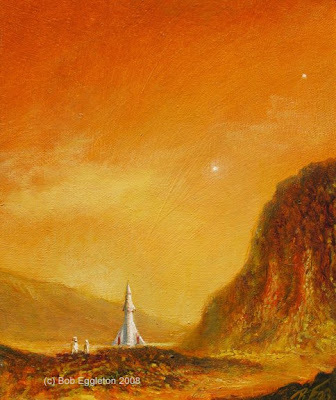 Speaking of, I sold the two below Mars images. Thanks to whoever bought them and only have the dragon left. Congrats go to Hugo winner for Best Pro Artist, Stephan Martineire(who I have known a long time in fact! )-his work is all over the place and, he really deserved it with his revolutionary work done on computer. This week is teaching an illustrator's workshop in Malibu!! Nice digs here too!!! I managed to do this whole trip as one big "triangle" around the west. I am due to be Artist Guest of Honor at Bubonicon next week and I didn't want to go all the way to Denver from Rhode Island only to come back again the following week the same path and, I'd always wanted to see New Mexico and the dinosaur/volcano and rock formations there, galleries in Santa Fe and such. So we did it all as one big trip. New Pieces for the Worldcon! Wow. I finally got back to painting some little pieces!!! I missed doing them, but being busy is good too!! In fact, I had to because I wanted to do some small things up for the World SF Con which is in Denver, starting Wednesday! 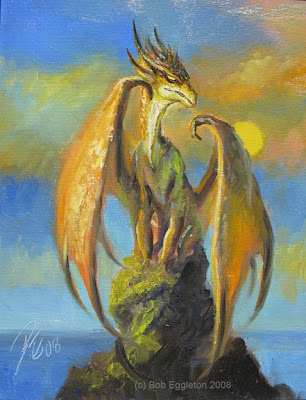 The top dragon was done as a demo at Barnes and Noble and I finished it up, in the studio later. He's probably going to be done for a much bigger painting for the upcoming "Dragon" book I'm doing. Anyway, enjoy these, it'll be a while before I post again as I'll be "on the move" in various parts of the Rockies. And back later in August. 'Til then! I had a small problem. I was unable to post due to a technical glitch in Blogger's main computer. They apologized and it seems to be all fixed. 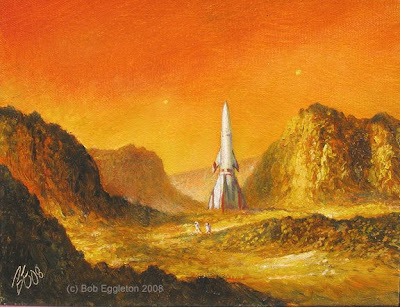 Getting ready for a bit of a trip soon, to Denvention, the World SF Con in Denver, later I'll post some of the paintings-small ones-I am taking. I don't like WOrldcons in the "middle of summer" as it seems to cut time in half for me and never "feels" right. But I also need some time away too.